This is my first Chinese Mogu Painting and my 558th painting since 2003. Also, it is the 38th assignment of China Central Academy of Fine Arts. 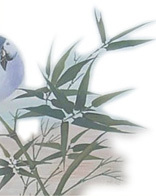 Instead of using lines at the first, Chinese Mogu Painting is painted by the color directly. So, it is a painting that uses the Chinese Xieyi's styles to create out the result of Chinese Gongbi. After a long distance travel from Australia to Shenzhen, and then from Shenzhen to Beijing. I was so tired, but, since I had missed the lesson for 1 week, I came to the classroom directly from the airport and I caught the instructor -- Mr. Zhang Gong as soon as I saw him first time. Then, I learned to paint the first paintings of Chinese Mogu. Since I had not watched the video of his lesson, I was a little bit confused how to paint it yet. But, since it is my first painting of Mogu, I try to publish it here as a memory.